Split body with no integral side outlet or mounting flange. Can he attached via clamping dogs to spools with flanges for 1 3 3/8”, 1 6”, and 20” BOP’s. 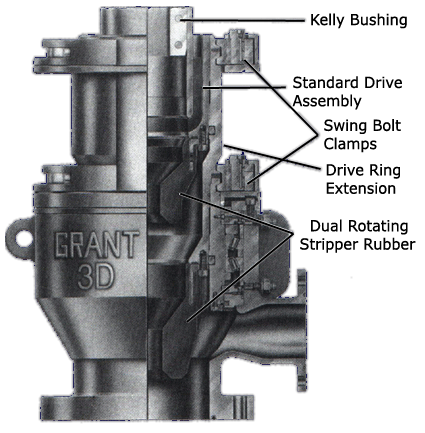 Drive bushing/stripper rubber assembly will pass through 17 1/2” rotary. Rotating Drilling I lead will pass through 27 1/2” table. 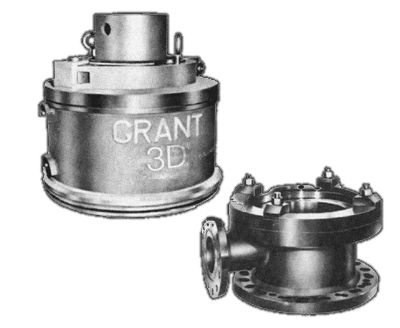 Used with mudline casing suspension systems when attached to 30” mounting flange. All internal parts interchangeable with Model 7068. KELLY BUSHING: 3 1/2” Hex or Square, 4 1/4” Hex or Square, and 5 1/4” Hex only. STRIPPER RUBBERS: 2 7/8”, and 3 1/2”, 4 1/2”, 5”, and 5 1/2”. (Stationary casing stripper rubbers, from 6 5/8” thru 10 3/4” on special order) Other sizes on special order. When ordering specify: (1) Model number, (2) Lower flange Size, (3)Outlet Flange Size , (4) Kelly Size and Shape, (5) Drill Pipe Size, (6) Drilling Environment, and (7) High Temperature Model if desired.